Cambridge is a small and busy city that wasn’t built with modern traffic flows in mind, so it’s best to visit the centre – where many of the University buildings and Colleges are situated – on foot. If you’re planning on driving to Cambridge, we strongly recommend that you use the Park & Ride scheme as parking in the city is limited and several city centre roads have restricted access protected by rising bollards, open only to buses and taxis or at particular times of day. Those travelling from the north can also use the Guided Busway Park & Ride services (follow signs for Longstanton P&R from Junction 29 of the A14). Disabled parking is available in the city’s car parks and on some streets. Please check in advance with the Cambridge Tourist Information Centre or visit www.cambridge.gov.uk/parking. National Express coaches usually stop on Parkside, next to Parker’s Piece in the city centre. The Stagecoach X5 service that links Cambridge and Oxford via Bedford, Milton Keynes, Buckingham and Bicester also stops on Parkside. Local services usually run to/from Cambridge bus station in Drummer Street, and/or the adjacent Emmanuel Street and St Andrew’s Street. There are frequent buses from the railway station to the city centre. The 'U' / Universal bus service bus service runs from Eddington, next to the Madingley Road Park and Ride site, through to our Biomedical Campus from Monday to Saturday, and from Eddington to Cambridge Railway Station on Sundays. Cambridge is well connected by train and the main station is located about one mile from the city centre (around 20 minutes on foot). There’s a taxi rank outside the station and buses run frequently between the station and city centre (to/from Emmanuel Street/St Andrew's Street). The 'Universal' bus service route (see above) also picks up/sets down at the Cambridge train station. 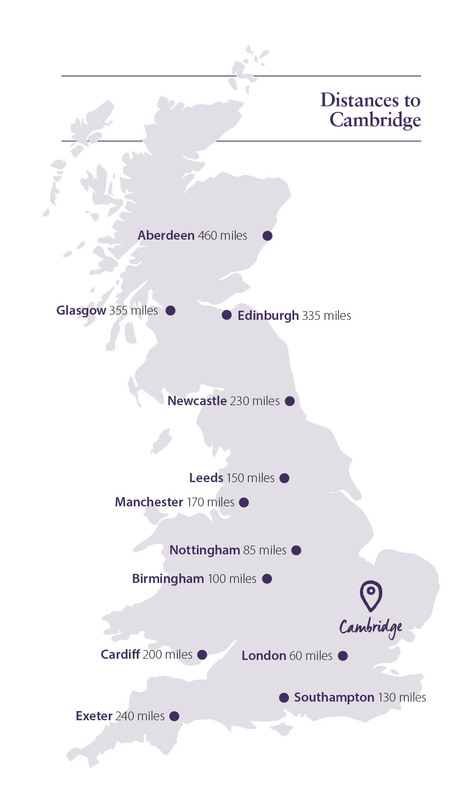 The nearest airports to Cambridge are Stansted (30 miles) and Luton (40 miles). There’s a direct train link to Cambridge from Stansted, and Heathrow and Gatwick are also easily accessible by train (via London King’s Cross/London St Pancras). In addition, buses regularly run from Stansted, Luton, Heathrow and Gatwick to the city centre.